Gorano Dam attracts a large number of migratory birds as a new wetland safe from hunting. Pakistan's warm waters have long been a refuge for millions of birds that migrate from Siberia to avoid the stinging winter every year. However, the numbers of migratory birds have fallen drastically in recent years due to massive hunting by hunters both local and foreign. But the poor birds have found a new wetland – safe from the threat of hunting – at least for now. Gorano Dam has a man-made reservoir in the remote Thar Desert, filled with saline water pumped out due to a massive coal mining exercise in the region and for power generation. 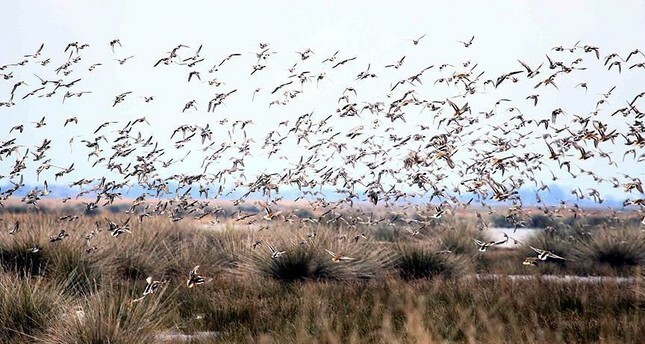 Located in the Gorano area of the Tharparkar district – some 347 kilometers from Karachi – and sprawling over 1,500 acres, the site is attracting a large number of birds that feed on fish, said a report by the International Union for Conservation of Nature (IUCN) after a recent ecological survey. Some species, the report said, have even started nesting on the partly submerged tree tops. "Due to climate change, the health of Pakistan's wetlands has deteriorated in recent years. In these circumstances, the popping up of a new water reservoir is a welcoming sign," Mahmood Akhtar Cheema, the country representative of the IUCN, told Anadolu Agency (AA). According to the IUCN's ecological survey, he said, Gorano Dam was relatively safe for migratory birds due to its low level of salinity compared to the country's other wetlands. He said, however, the ecological survey had still suggested further steps to provide a better environment for the migratory birds. Every year over a million birds cover a grueling distance of 4,500 kilometers to migrate from Siberia in search of moderate waters to spend the harsh winters, according to conservation groups, but Cheema said "a scientific study is required to estimate the exact numbers." Their ultimate destination is India, but they make stopovers at various lakes and water reservoirs in Pakistan, mainly in the southern Sindh province. These birds include houbara bustards, cranes, teals, pintails, mallards, geese, spoon bills, waders, and pelicans. Climate change and the uncontrolled hunting of several rare species have forced the migratory birds – also known as guest birds – to look for other peaceful sites in South Asia in recent years, say environmentalists. Cheema said, "A 20-30 percent reduction in the numbers of migratory birds has been recorded in recent years, according to regional reports." So much so, the unchecked exercise has endangered several rare species, mainly the houbara bustard, which is constantly being hunted by Arab royals despite opposition from both environmentalists and locals. The central government, which calls the issuance of hunting licenses to Arab royals a "cornerstone" of its Middle East policy, has recently issued fresh hunting licenses to several members of the royal families of Saudi Arabia, the United Arab Emirates, Qatar, Bahrain and others. At least two provincial governments, the Sindh and Khyberpakhtunkhawa provinces, have time and again opposed the issuance of any further hunting licenses to the Arab hunters, arguing they not only disturb the local wildlife but also pose further threats to the existence of several migratory birds, especially the already endangered houbara bustard. The Pakistan Tehreek-e-Insaf (PTI) government of Prime Minister Imran Khan had been opposed to the "bird diplomacy" when he was in opposition but after coming to power, his government too recently issued hunting licenses to Arab royals.